Over the coming months, we’ll be introducing members of the CSH Transport team. CSH Transport has been in operation for nearly 40 years. Our team is an exceptional group of people, delivering outstanding 3PL service to all our clients. We have over 70 members of the team, from finance, marketing and administration to warehouse operations, fleet maintenance and drivers. 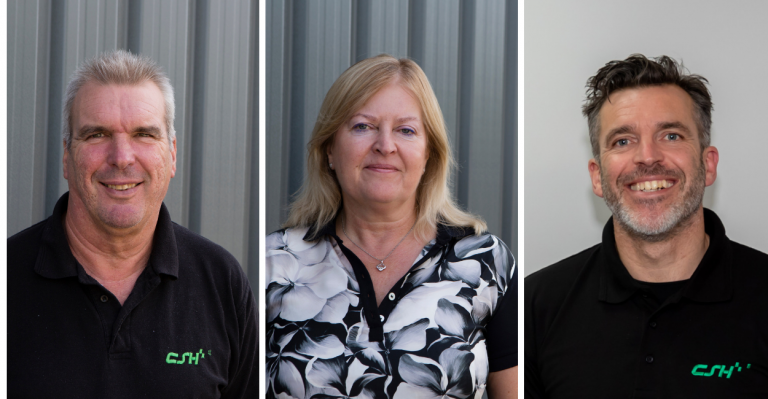 Here we introduce you to the Haworth family – Stuart, Christine and Chris Haworth. CSH Transport was founded in 1979 by Stuart Haworth who continues to drive the evolution of CSH Transport into some very exciting times. Always willing to embrace change and its opportunities Stuart was an excellent county-level sportsman in football and squash. He competed throughout the North-West for both school and clubs. The drive, commitment, willingness to adopt new techniques, teamwork and competitiveness required in sport has transferred very well into the business world. Stuart has built and nurtured a great team at CSH who are eager, willing and service-orientated, providing our clients with the best 3PL service and experience. Christine Haworth is the co-founder, Financial and Legal director of CSH Transport and has overseen forty years of legal and financial evolution in the 3PL industry. A long term supporter of many charities both in the regional and national communities, Christine is a very keen music, sports and language fan. Sunday’s are often spent cycling, golfing or winding down with a French or Italian book. The third generation of Haworths to be involved in 3PL, Chris grew up with CSH Transport remembering a sole vehicle in 1979. To now working on CSH’s current development as we head towards the 2020’s and our fifth decade in business. Prior to his UK return, Chris was a professional sportsman for fifteen years competing and coaching internationally. He worked with one of the world’s leading winter sports manufacturers, Salomon (GB & International). Initially contracted as a sponsored athlete, Chris naturally gravitated into marketing, product testing and development. He became one of only a handful of British skiers to ever work on developing race equipment for World Cup level ski racing. Chris is a fluent French speaker and he oversees marketing, communications and management systems for CSH. With a diverse European family history, Chris has managed the redevelopment of our website. He now works on the integration and management of the external Client Portal and internal management networks at CSH. All aiming to provide the best 3PL experience for our clients. If you would like to join the CSH team, please have a look at our Careers page. CSH Transport operates in dry freight, liquid bulk, specialist chemical transportation and storage. Please call the CSH Transport team on +44(0) 1254 660007 or email us if would like a quote for your transport and logistics requirements.